A neo-classical church built for the 4th Earl of Harborough in the grounds of Stapleford Park. St Mary's is a wonderful example of Gothic Revival style, an almost perfect time capsule of early 18th-century taste. 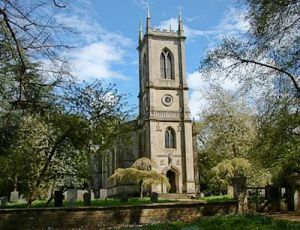 The church was built in 1783 in the park surrounding the stately home of Stapleford Hall. Capability Brown transformed a former deer park into the lovely landscape we can see today. The interior is a light and airy space, with elegant wooden pews facing each other across the nave. The walls and ceiling feature lovely plasterwork decoration. There is an oak gallery over the west end, which served the Earl's family as their private pew. The gallery is furnished with its own fireplace to keep the family comfortable during services. In many ways, St Mary's has more of the feel of a private chapel than a parish church. The primary interest in the interior are the monuments to members of the Sherrard family of Stapleford Hall. Many of these were salvaged by the 4th Earl from an earlier church on the site and installed in his new building. The best of these memorials is a monument by John Michael Rysbrack, a Flemish-born sculptor, to the 1st Earl and his wife. The couple are shown in Roman costume, with the reclining Earl looking more like a Roman Caesar than an English nobleman. There is also a very fine 17th-century tomb to Sir William Sherard(d. 1640) and his wife Abigail. St Mary's is not in regular use and is cared for by the Churches Conservation Trust.